At present ISKCON Trinidad and Tobago comprises 4 temples. Each of these temples has an administrative head in the form of a Temple President who oversees the day to day running of the temple. Each temple president is assisted by a board consisting, but not limited to, a Vice President, Secretary and Treasurer. Additionally ISKCON, being a member of ISKCON International, functions under the direction of the Governing Body Commission (GBC). The GBC was established by Srila Prabhupada as the maximum managerial entity in ISKCON and comprises a board of senior and competent devotees in our organisation who collectively manage the affairs of the entire organisation. Each member of the GBC may have one or more territories under his supervision. 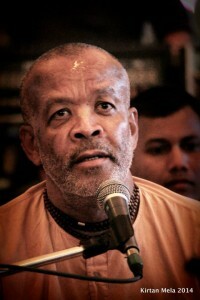 Our local GBC is His Holiness Guru Prasad Swami. 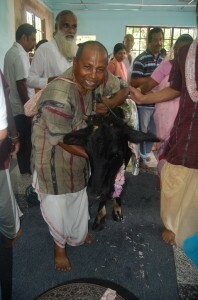 He also serves as the main initiating spiritual master (guru) here in Trinidad and Tobago. Click here for a short biography of H.H. Guru Prasad Swami. Guru Prasad Swami was born in the USA and studied nuclear physics at Purdue University. After becoming disenchanted with science he transferred to the University of Texas where he made contact with the Hare Krishna movement; but it was later, during his military service in Panama when this encounter with ISKCON changed his life dramatically. 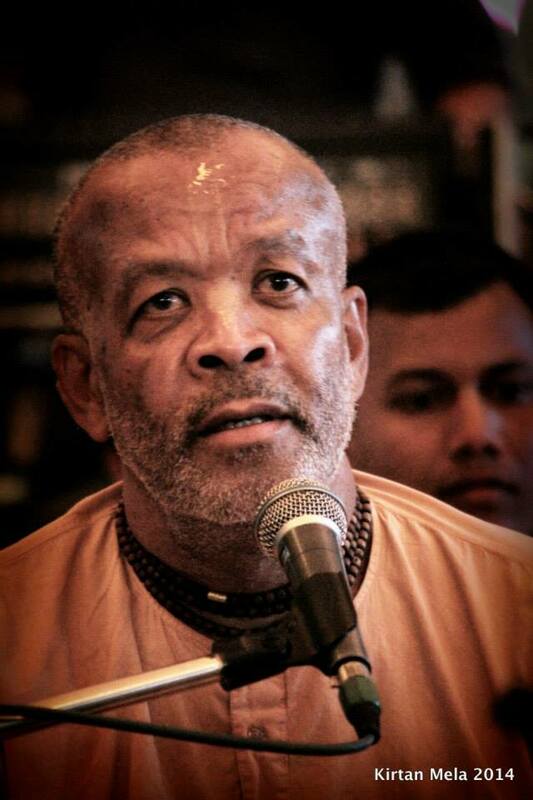 Upon concluding his military service Guru Prasad Swami joined a pioneering group of Krishna devotees in Central America stationed in San Jose, Costa Rica. He attended the 1976 Mayapur-Vrindavan festival and was initiated by Srila Prabhupada there. He received sannyasa initiation in Rio de Janiero in Brazil in 1982. After Srila Prabhupada’s passing away, he traveled through different countries of Latin America, preaching, inaugurating temples, installing Deities, and collaborating with diverse services. In 1982 he was awarded sannyasa initiation by His Holiness Hrdayananda das Goswami on behalf of Srila Prabhupada, in Rio de Janeiro, Brazil. Thenceforth he is known as “His Holiness Guru Prasad Swami,” and travels through different temples to expertly and genuinely preach Sri Caitanya Mahaprabhu’s message. 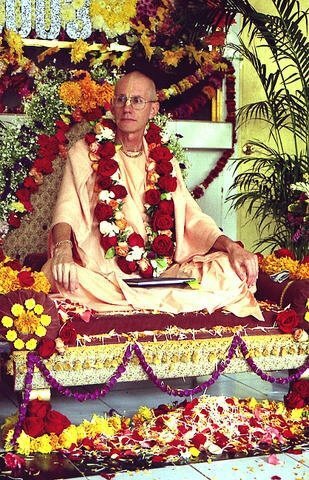 At Gaura-purnima festival, celebrated in Mayapur, India, in 1987, he was appointed-due to his well-known qualities of leader-member of the GBC (Governing Body Commission), the maximum administrative organism of ISKCON; the zone where he carries out that service is Mexico, Central America, Panama, Colombia, Venezuela and Trinidad and Tobago. Santa Vigraha dasa (Shirvan Ramjit), a teacher by profession, took to the practice of Krishna Consciousness as a student of Presentation College San Fernando. He was instrumental in the development of the ISKCON Youth Club of Presentation College and He went on to pursue a BSc in Information Technology and Management as an external student form the University of London. In 2004 he undertook the study of the Bhakti Shastri Degree from the Mayapur Institute of Higher Education and Training in West Bengal, India. He is also trained in conflict resolution and mediation. His greatest love is the study of Srila Prabhupada’s books and sharing that knowledge with others. He often teaches classes on the Bhagavad Gita at our temples as well as upon invitation. He is also the presenter of Jnana-Chakshu, a weekly radio program broadcast on Heritage Radio 101.7FM. 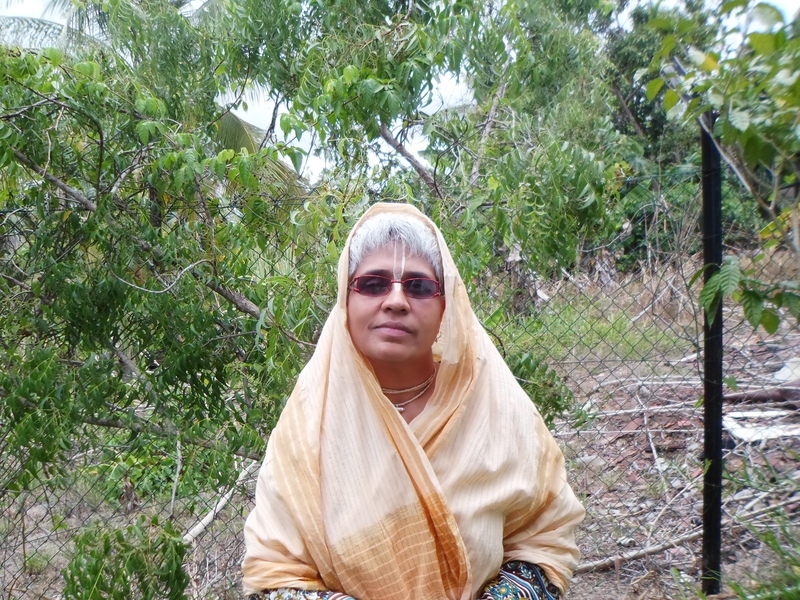 Sri Radha Devi dasi, a Mauritian by birth and a graduate of Chemical Engineering from I.I.T (Indian Institute of Technology) Kanpur , is a Senior Lecturer at UTT(The University of Trinidad & Tobago). 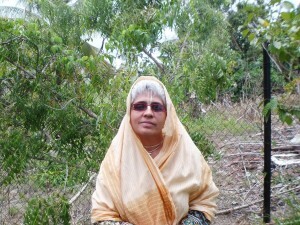 She took to the practice of Krishna Consciousness since 2002. She has served as treasurer in the Temple Board as well as the Committee for the P.O.S Rath Yathra. At the university, in collaboration with another devotee lecturer , she have been preaching the philosophy of the science of God both within the academic/ administrative staff and the student community. Her love for sharing spiritual knowledge is displayed through the counseling sessions that she offers both to the staff and the students in their moment of need. Pavana dasa (Winston Rajkumar Ramcharan), took to the practice of Krishna Consciousness in 1997 and is a disciple of His Holiness Guru Prasad Maharaja. He has been a leading organizer of Ratha Yatra festivals for the past sixteen (16) years and loves distributing Srila Prabhupada’s books to the public. Pavana dasa has served in several positions in ISKCON’S management in the past and is presently the secretary of the National Board and a member of the local arm of the Child Protection Committee. He is a graduate of Couva Government Secondary School and is a member of the Trinidad and Tobago Police Service. In 1993, he exchanged marriage vows with Gemma and is the father of Anupa and Gopala. 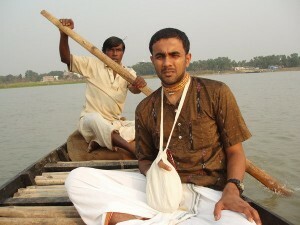 Kanta Dasa (Karan Gayadeen) came in contact with ISKCON in 1984 and took to the practice along with his entire family. He was initiated in 1993 and served as a pujari for some time. In 1995 he was appointed PRO of Sri Sri Radha Gopinatha Mandir and in 1996 he co-ordinated the local Srila Prabhupada Centennial Celebrations. He was instrumental in the drafting of our the Local ISKCON Constitution as well as leading the Society in the debate at Trinidad and Tobago Parliament for the incorporation of ISKCON Trinidad (Act 27.1998). 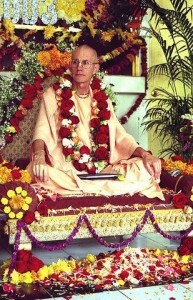 In 1999 he assisted in the obtaining of Charitable Status for ISKCON Trinidad, approved by the Ministry of Finance. He also assisted in having ISKCON having its first local marriage officers appointed. In 2008 he opened a preaching centre at his home and in 2011 he was re-appointed as PRO of the National Board. He is currently working towards formally establishing a unit to assist underprivileged devotees in Trinidad. Agnideva dasa was born in Trinidad and Tobago but moved to New York in his youth. It was there he met the devotees and became involved in the Krishna Consciousness Movement and later received mantra initiation from Srila Prabhupada. His study of the Vedic philosophy led him to discover the devotional music of West Bengal, India. In 1972 he began publicly performing bhajan and kirtan in the traditional Bengali style. He is renowned even up till today a one of the most expert and devotional singers in ISKCON worldwide. He served as a temple president for several years at ISKCON’s Laguna Beach temple and also successfully ran his own restaurants. 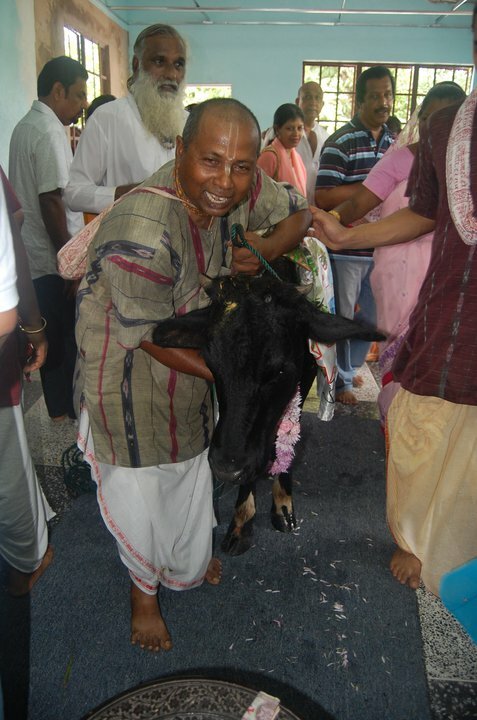 Agnideva has now retired and seeks to dedicate more of his time to Srila Prabhupada’s mission. Since 2013 he has returned to Trinidad and assumed the service of president of our local headquarters, Sri Sri Radha Gopinatha Mandir, where he goes out with the temple devotees on harinama chanting to various locations in Trinidad at least 4 days a week. Mahananda dasa is along standing devotee in our local community. He used to use his home in Cunupia as a preaching centre, and this served to attract many persons to Krsna Conscious philosophy and practice. he also served for several years as the President of Sri Sri Radha Gopinatha Mandir and was instrumental in establishing our local Ratha Yatra festival, in face, he actually carved our local Jagannatha, Baladeva and Subhadra deities. He currently serves as President of our Madhuvan Farm Project where the deities he himself carved reside. For over 10 years he has been the driving force of the development that is taking place at the farm project. Rasika-mauli das has been involved in the Krsna Consciousness movement for many years now. For years he served as ISKCON’s main priest and is presently our only licensed marriage officer. Previously he served as secretary of the National Board as well as on the festival committee, both as co-ordinator and in other capacities. He currently serves as the president of our Arouca temple. Krsna-Kripa dasa is the longest serving temple president in our local community, with almost 20 years of unbroken service. He has also served in the past as National Board President. Formerly a member of the Trinidad and Tobago Police Service, he runs the ISKCON South Temple with a great level of efficiency and organisation. He displays exemplary determination in carrying out Srila Prabhupada’s Mission, in that, despite recent health issues, he still maintains his service with great tenacity. One of his favorite sayings is: Any job, big or small, do it well or don’t do it at all.